Virtual phone systems and services have revolutionized the way small businesses communicate, both in-house and to their customers and clients. From affordable VoIP plans to comprehensive virtual receptionist services; in 2018 there is an ever-growing list of options available. So what path should you take for your business? That’s what we will look into today. We have selected a range of phone services to give you the low down on some of the best solutions currently on the market. If you have already begun your research into the sector, you will know that there are many different providers of virtual phone services. The quality, scope, and pricing of the packages available is wide. That being said, each can rated based on customer service and professionalism, reliability, network stability, and affordability. Based on these rating criteria, 5 of the best virtual phone systems and services have been identified and chosen for review. Conversational.com gets our top pick virtual phone receptionist service for very good reason. First and foremost is the overall flexibility provided. The company offers packages with both free and optional services that can be updated or changed as the user sees fit. Secondly, is the overwhelming positive feedback that Conversational enjoys, with a long list of 5 star industry ratings and consumer reviews. From large, global corporations to mom-and-pop businesses, the quality of services being offered does not falter. And first impressions count of course. With Conversational you can expect a professional virtual receptionist (and/or assistant) to answer your calls whenever you are unable to reach the phone. The company offers 3 pricing plans; the Small Biz Special, Business, and Corporate plans. appointment reminders, and fully personalized service. That’s a huge list of services offered by Conversational Receptionists. Giving you peace of mind to focus on what’s important; running your business. As a virtual receptionist, Conversational business package comes with a live call answering service that allows all calls to be answered promptly. Needless to say, the virtual receptionists are fully trained to perform the call handling duties in a professional manner. Likewise, if the client needs customized answering service that is tailored to their business, Conversational can design such an (answering) service as part of its customized call handling package. Also, customized call handling package allows you to select the best virtual receptionist that suits you. Likewise, the client can provide their real (mobile/fixed) telephone number to the virtual receptionist so that callers can be redirected to them if specialized assistance is needed. Even so, Conversational can handle general inquiries related to the types of services or products being offered by a client, i.e you. This service is offered as part of its basic customer service, and because Conversational operates 24/7 across the globe, potential customers can learn more about your products and services. This business plan also comes with advanced call screening that shields the clients from intrusive calls from telemarketers and aggressive salespeople. The virtual receptionist records key details of the call and caller and then forwards this details to you so that you can choose whether to that phone-call can be transferred to your telephone or not. Another unique feature of Conversational Business package is that it allows you to set temporary phone-call instructions that allows you to instruct the receptionist to take your calls and then deliver them later on to you. This enables you to attend to an emergency or enjoy some hobby without worrying that you are missing some business calls. This Business package allows you to make outbound calls, which allows the receptionist to reschedule appointments, deliver information or collect information. One can also mold a tailored lead generation service using by combining the outbound calls feature with live call answering. This package also supports appointment booking so long as you give the receptionist access to your scheduling software. This appointment booking feature allows you to make appointments in real-time, update your schedule, and reschedule or cancel appointments. Likewise, this package handles appointment remainders, which alongside appointment booking, suits it as a virtual assistant service as it ensures that you do not miss an appointment. This Conversational package comes with a voicemail box that stores voice messages. This voicemail feature supports 2 messaging protocols. The first message-to-email protocol allows for recorded voice message to be transcribed and then delivered as a text message via email. The second message-to-SMS text protocol allows for the transcribed message to be delivered as an SMS(short messaging service) message to your phone. There is the the one-way secure text notifications that allows the receptionist to deliver important messages to your cellular phone. This package allows you to personalize the available services, which means that you can determine how your calls are routed, can personalize greetings for each of your priority callers, personalize on-hold music using your own sound file or music selected from Conversational music library, and choose when to turn off and on the service as per your schedule. Even so, because virtual receptionists interact with your customers, it is vital that you explain your business operations to them as improper comprehension/understanding of your business operations can result in poor quality of service to your customers. This package provides a local number and toll-free numbers are also available. Moreover, the package comes with 200minutes with additional minutes being subjected to overage charges. For a new client, Conversational offers a free 30-day trial for the Business Plan package. Virtual receptionists are experienced, background-checked and professional receptionists. Local phone number and toll-free numbers available. Superb call forwarding, transferring, and screening services. Appointment management, including booking and reminders. Unlimited talk time after call transfer. User can upgrade, downgrade, or cancel the package. Quality of service is dependent on the level of knowledge the receptionist has of your business operations. The onus is on you to make everything as clear as possible when you first sign up to the service. It is hard not to over-state just how a virtual receptionist service such as Conversational can impact your business for the better. Not only will the service raise the professional image of your enterprise, it also frees you and your staff from the burden of general front-line administrative duties. Overall, the superb customer service, reliability, professionalism and affordability of the Conversational Business Plan makes this the best virtual receptionist service currently on the market today. Our top pick VoIP phone service is VirtualPBX; a provider that not only has one of the best selection of VoIP services currently on the market, but also offers certified pre-configured and ready-to-use VoIP phones within relevant plans. These are the hard phones that are connected to the VoIP server, and these phones can be matched with VoIP-compatible landline phones or conference room phones so as to optimize the virtual VoIP phone system. Likewise, VirtualPBX provides a Desktop Soft-phone as well as a free mobile Soft-phone App. This VoIP service can be integrated into any one of the 3 dash plans offered by VirtualPBX. These dash plans are Basic, Pro and Unlimited dash plans, with only the Basic plan coming without a VoIP phone and audio conferencing capability. These products and services are offered by VirtualPBX.com, Inc. The VoIP phones have inbuilt intelligence that allows them to identify themselves in Internet-powered networks, as well as decode or encode voice calls using verified VoIP standards. This is possible because these VoIP phones are registered a VoIP-PBX phone service provider, and depending on the level of functionality that comes with the package, multiple phones can work together in the VoIP system. The mobile Soft-phone app allows a cellular phone to make WiFi calls. Most of the VoIP phones support both VoIP communication and traditional PSTN telephony, with the gateways in the VoIP server handling the protocol conversion task. VirtualPBX allows its clients to rent out VoIP phones alongside associated hardware at an affordable rate. This allows small businesses which cannot invest in the VoIP system hardware, including VoIP phones and enterprise-grade router, to still benefit from a VoIP phone service. The equipment rental agreement offered by VirtualPBX also allows one to rent a set of VoIP service hardware that is tailored to specific needs, or that fits set budgets. Likewise, it allows some businesses to upgrade their VoIP infrastructure albeit temporarily. In the Pro and Unlimited Dash plans, a single VoIP device is provided to the user, alongside free 24/7 customer support and unlimited VoIP minutes for communication between system users. This VoIP device is central to the VoIP phone service as it is the main client that allows the user to connect to a virtual VoIP server. Even so, neither of these plans comes with an integrated Soft-phone CRM (customer relationship management), and the user needs to perform this task. Once the Soft-phone is integrated with a suitable CRM, the services offered by that soft-phone is superb. Comes with certified pre-configured and ready-to-use VoIP hard phones. VoIP phones can be integrated into an existing VoIP phone system. User can upgrade, downgrade, or cancel a Dash plan. Provides both hard phones and soft-phones. Unlimited VoIP minutes for communication between system users. VoIP phones support VoIP communication and traditional PSTN telephony. Requires expertise in installing the VoIP phones to existing VoIP infrastructure. Soft-phone comes without an integrated CRM. VirtualPBX VoIP is a virtual VoIP phone service that comes with certified pre-configured and ready-to-use VoIP phones. These hard phones are connected to the VoIP server and can be matched with pre-installed VoIP-compatible landline phones or conference room phones. Likewise, a Desktop Soft-phone as well as a free mobile Soft-phone App are available. 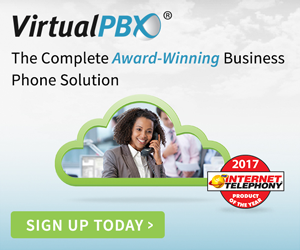 As the industry leader with the accolades to match, VirtualPBX is the go-to choice for your VoIP phone system needs. Highly recommended. AxVoice is a bundled business VoIP service that comes with VoIP calling and conference calling features, as well as capacity to add multiple phone lines. It is offered as a budget package for small businesses and is equipped by an online account management that allows the user to manage the VoIP phone from anywhere at anytime. Caller ID with Name feature. Likewise, this bundled package allows one to run office phones using a hosted PBX system, which ultimately improves productivity and workplace flexibility. Moreover, it gives the user the complete functionality of an enterprise-level telephone system without investing on a business-grade on-premise PBX phone system. The hosted PBX solution of this package comes with 200minutes of outgoing calls, that can be used to call landlines and cellular phones across North America. Also, the easy scalability of this package allows the user to add features as needed. The required hardware for the package is provided free of charge. However, the user must ensure that there is a high-speed internet connection, a touchtone phone, and at least one spare ethernet port for plugging the Axvoice phone adapter so that regular internet data traffic and internet phone service can be available simultaneously. This package offers high-quality voice calling alongside superb call forwarding services that allow VoIP phone calls to be directed to a pre-set telephone number while unanswered calls can be directed to another pre-set telephone number, while failed calls due to long ISP latency/delay, or downturn, can be directed to yet another pre-set telephone number. Likewise, there is a Failover feature that allows incoming calls made when the ISP is down to be directed to another pre-set number so that failed calls are kept at a minimum. The conference calling feature allows the user to add more callers/listeners to an ongoing phone conversation, as well as disconnect some of these callers without hanging up (or stopping the conversation) with the original caller. On the other hand, the blacklist feature allows the user to block specific numbers, while the Do-Not-Disturb feature switches off the phone ringer. Also, in-network calling is free. The enhanced voicemail feature allows the user to access the voice messages without a VoIP phone, and this is done either through a web browser or a registered mail. Offers complete functionality of an enterprise-level telephone system. High scalable as the user can upgrade, downgrade, or cancel a pricing plan. Comes with 200minutes of outgoing calls. Has an online account management system. Requires a touch-phone and router (or switch) to operate. The AxVoice Business Plan is a bundled business VoIP service that comes with VoIP calling and conference calling features, as well as capacity to add multiple phone lines. It is offered as a budget package for small businesses and is equipped by an online account management and call filtering features. CallHippo is another top virtual phone system that bundles virtual telephony with workflow intelligence, while obviating the need for a desk phone. This easy to setup cloud-based VoIP phone system comes complete with call analytics, call recordings, status reports, add phone features and ability to set work hours. It also comes with a virtual PBX, interactive voice response (IVR) including multilingual IVR capability, and CallHippo SDK(Software Development Kit) that allows for compatible apps to simplify telephony integration. Moreover, its end-to-end administration portal allows the user to have an in-depth view of activities, which allows one to determine conversion rates in telemarketing campaigns as well as the degree of seamless operation of an integrated telephony. This system supports CRM integration with popular CRM platforms such as Pipedrive, Zoho, Freshdesk, Zendesk, Intercom, WakeUpSales, and Slack CRM. CallHippo provides local phone numbers for 58 nations. Likewise, it supports seamless team collaboration through its Team Collaboration and Ring All features. The former feature allows one to instantly manage the calls to teammates and clients, while the latter feature allows one to associate several team members with a particular number, and when any one of the associated members (including the user) calls that number, the phone of all the team members ring. This phone system can handle general inquiries related to the types of services or products being offered by a client, with this service being available 24/7 regardless of the time zone of the caller. It also comes with a voicemail box that stores voice messages with the message-to-email protocol allowing for recorded voice message to be transcribed and then delivered as a text message via a registered email. This system also allows one to personalize greetings and on-hold music using a custom sound file. This bundled package comes with 4 pricing plans; the Basic, Bronze, Silver, and Platinum plans. All these 4 plans offer soft phone features, customized welcome message, ring all devices, forward to device, call hold, on call notes, IVR, voicemail-to-email messaging, and click-to-call chrome extension capabilities. Also, all the plans support 3-digit editable extension and CRM integration with the aforementioned CRM platforms. Exceptional customer service is provided to all users, regardless of the plan they are using. This system also support call filtering and call identification via the Incoming Call ID feature, and it can still allow calls from any number to go through (expect those from blacklisted numbers). The Bronze, Silver, and Platinum plans allows the user to customize the hold music. Data records for Bronze and Basic plans are stored for only 3 months. There is no dedicated phone-based customer support for Bronze and Basic plans. The CallHippo Virtual Phone System bundles virtual telephony with workflow intelligence, while obviating the need for a desk phone. This easy to setup cloud-based VoIP phone system comes complete with call analytics, call recordings, status reports, add phone features and ability to set work hours. It also comes with a virtual PBX, IVR, and CallHippo SDK. Tossable Digits is a virtual number service that sells disposable access numbers that can be used for a short time (2-10 minutes). Its affordable service does not require any contract, which allows the user to cancel their plans or to abandon the service altogether. There are 4 pricing plans; the Basic, Advanced, Professional, and Pay-as-you-go plans. It also allows one to port a telephone number to an access number. These services are provided by Telusion, Inc. The basic, advanced, and professional plans come with 60minutes, 400minutes, and 1,00minutes for outbound calls, with additional minutes charged overage fees. The call recording features allows one to record any phone conversation. The voicemail feature allows for storage of voice messages, and it supports 2 messaging protocols. The message-to-email protocol allows for recorded voice message to be transcribed and then be transmitted as a text message via email, while the message-to-SMS text protocol allows for the transcribed message to be delivered as an SMS message to a cellular phone. The outdial feature allows the user to make calls to other people, with the access number showing as the CallerID in the cellular phones of the recipients. The set rules feature allows one to personalize the available services, which allows one to determine personalize greetings, customize on-hold music using custom sound files, as well as choose when to turn off and on the service. The call screening feature shields the user from intrusive calls from telemarketers and aggressive salespeople. Likewise, the RoboCall blocking feature is dedicated to blocking calls from known telemarketing firms that use automated robots to make calls to potential customers. Meanwhile, the call announce feature allows the user to know that someone is ringing the access number, with the CallerID control revealing the identity of the caller hence allowing the user to determine whether to pick the call or not. Call forwarding allows the access number to forward calls to a pre-set telephone number. Meanwhile, important SMS messages from the virtual number provider being relayed directly to the telephone of the user. This package offers local phone numbers for over three dozen countries, with billing for each country being customized to the telephony market of that country. Offers access number for short duration usage. Provides local phone numbers in multiple nations. Superb call forwarding and screening services. User can upgrade, downgrade, or cancel a package. Call rules does not allow one to fully set the work hours. This affordable service does not require any contract, which allows the user to cancel their plans or to abandon the service as they see fit. A low risk virtual number service that comes highly recommended. Internet technology has revolutionized communication and modern workplace dynamics. This revolution has powered the establishment of virtual offices – rented digital spaces that provide office services without the need for a physical office space. The virtual business services offered in the virtual office include a virtual address and a virtual receptionist, along with a virtual phone number that allows customers to access the provided virtual services. This in turn allows the virtual phone number owner to always have a voice presence across the globe, that is, (s)he can be contacted by anyone across the world, and at any time, with that person always receiving a voice feedback from the virtual number. The virtual number therefore allows one to own and single-handedly operate an (digitized) office that provides all the basic office services, and this type of digital workplace (or workspace) is suited for small business owners and professional small-scale independent contractors. The virtual phone number, also called virtual number or access number, is simply a telephone number that is not directly associated with a physical telephone number. This means that the virtual number is not connected to the public switched telephone network(PSTN) which is the physical infrastructure that underlies telephony. How does the virtual number service work? So how does the virtual number connect its owner to the physical world? It does this by forwarding incoming calls to the telephone number of the physical phone of the owner. For this reason, it is called a follow-me number. Also, if this call forwarding is configured to be given precedence over the auto-attendant in the virtual private branch exchange(PBX), then the virtual number is considered a direct inward dialing(DID) or direct dial-in(DDI) number. The virtual number must be programmed, or configured, to forward incoming calls to a preset telephone number chosen by the (virtual number) owner. The telephone number chosen can be a fixed line number, mobile number or VoIP number. The owner can likewise program the virtual number to forward incoming calls to any one of the preset telephone numbers. To do this, the virtual number must be configured to operate with an auto-attendant, or automated answering service, that comes with a call menu that routes the incoming call to a pre-defined telephone number. This allows the owner to connect the virtual number to the telephone numbers of his/her salespeople, virtual receptionists, or virtual marketing consultancy. The virtual number phone system enables businesses located outside the U.S to use U.S phone numbers to connect their clients to company representatives located outside the U.S, or for call centers based in a foreign land to use a U.S phone number to communicate with its American clients. Therefore, the virtual phone number allows foreign businesses to use local phone numbers without investing in fixed foreign exchange lines and associated hardware, while at the same time efficient 24/7 voice services to different time zones. This makes virtual phone services the most affordable and efficient alternatives to foreign exchange lines. The virtual number is central to the provision of virtual services, as one can only access these services by first going through this number. The combined telephony infrastructure that facilitates provision of virtual services is called a virtual phone system. Nowadays, most of these virtual services are delivered through Voice over Internet Protocol(VoIP). VoIP is the collective term that describes the technologies, methodologies and protocols that allow for voice communication via the internet network through ethernet-connected devices. Because this communication occurs through the internet, the audio of the voice calls must be digitized into digital data packets, called datagrams, which can be delivered across the packet-switched internet network. The protocols that govern how this datagram is transmitted across the internet from its origin to destination are collectively called the Internet-protocol(IP) suite, with the Internet Protocol(IP) governing how datagrams are across network boundaries (that is, from the internet into the computer device or networked computer devices). The Transmission Control Protocol(TCP) provides for a reliable, error checked, and ordered delivery of data stream across applications running in computer hosts in the internet network. Therefore, TCP and IP ensure that data integrity is preserved during transmission and that the data reaches its intended target. As expected, VoIP uses the internet infrastructure to facilitate both multimedia sessions and audio communication. In the VoIP setup, there is the VoIP server (colloquially known as IP-PBX), which is connected to a switch which in turn connects to the router that relays data to the internet. The VoIP servers allows all the Ethernet-connected hardware devices plugged to the switch to communicate with each other, as well as provides ports for plugging in digital or analogue phones. The IP trunk lines (analogous to telephone lines) for calling in or calling out of the IP-PBX are connected to their respective ports in the VoIP server. The computer devices connected to the VoIP server are called VoIP clients. Two of the most important VoIP clients are soft phones and hard phones. Hard phones are physical VoIP telephones, while soft phones are computer applications/programs that allow a computer to serve as a VoIP telephones. So can one use a VoIP virtual phone system to connect to the standard PSTN telephone infrastructure? The VoIP virtual phone system can be connected to a standard PSTN telephone infrastructure using a special device called a gateway. A gateway connects to the VoIP server and also has a port for the normal telephone line, and it serves to route the audio communication from the VoIP system to the normal PSTN telephone. To do this, the gateway serves as a protocol converter that allows for the digital audio data in the VoIP server to be converted into audio signals that can be transmitted via telephone lines. A good thing about VoIP system is that one can use a virtual VoIP server to manage the entire virtual phone system. Generally, high-speed internet connection improves the signal reliability of the VoIP virtual phone system, which makes this system both reliable and cheap as compared to ordinary telephony. In this VoIP virtual phone system, the voice calls are digitized into transferable data packets that are transmitted through fiber optic cables or satellite communication, and the recipient computer transforms the reassembled data packets into audible voice calls. The instructions of how the data packets must be reassembled and pieced back together are transmitted in the datagrams alongside the data packets. This gives the virtual VoIP phone system an advantage over ordinary telephone systems as 2 or more phone calls made through the VoIP server can be transmitted over a single cable, and this makes it an efficient mode of transferring calls. Likewise, the data can be compressed using special delivery protocols that use codecs for encoding data, and this allows the VoIP phone system to be used for complex phone routing, digital faxing, and enhanced messaging; thus allowing this system to cost-effectively deliver these services to the clients. Therefore, when is searching for the best virtual business phone service, they should check if the service provider offers data compression and encoding services.